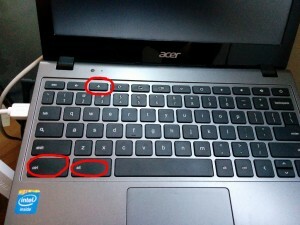 I let the battery die completely on my Acer C720 Chromebook, and discovered that unfortunately if you do that, your Chromebook will no longer Legacy boot when you press Ctrl-L – it just beeps at you despondently, with no error message to indicate what’s going wrong. Sadly, I found message after message on forums indicating that people encountering this issue just reinstalled ChrUbuntu from scratch. THIS IS NOT NECESSARY! 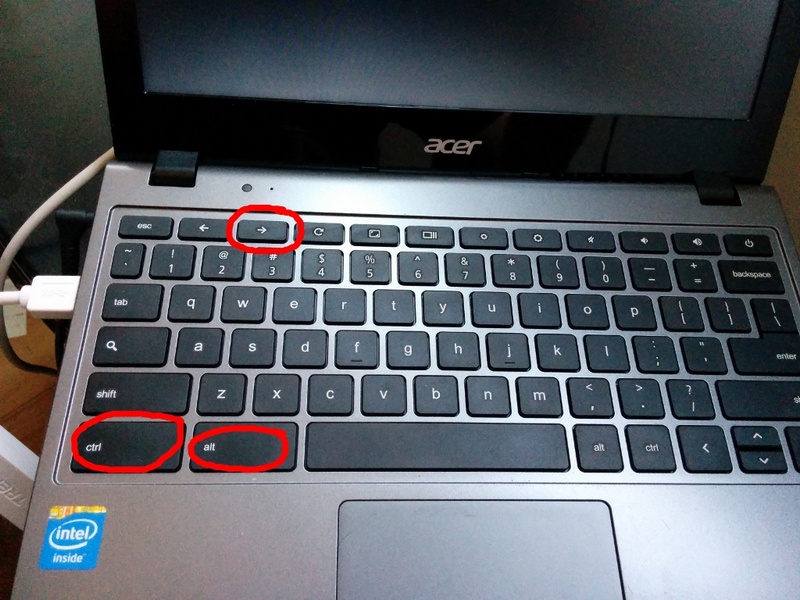 If you just get several beeps when you press Ctrl-L to boot into Linux on your Chromebook, don’t fret – press Ctrl-D to boot into ChromeOS, but DON’T LOG IN. Instead, change terminals to get a shell. The function keys at the top of the keyboard (the row with “Esc” at the far left) map to the F-keys on a normal keyboard, and ctrl-alt-[Fkey] works here just as it would in Linux. The [forward arrow] key two keys to the right of Esc maps to F2, so pressing ctrl-alt-[forward arrow on top row] will bring you to tty2, which presents you with a standard Linux login prompt. That’s it. You’re now ready to reboot and SUCCESSFULLY Ctrl-L into your existing Linux install.